Cooking can be an incredibly rewarding activity. Many of us think of it as a hobby and not just a necessary task. However, many aspects can quickly turn cooking into a stressful challenge rather than an enjoyable pastime. 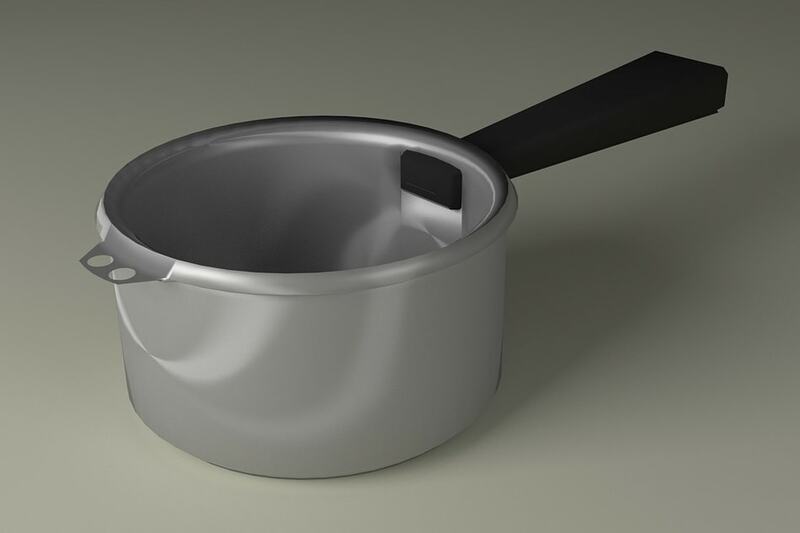 Whether you are getting older or are suffering from a wrist injury, lightweight saucepans are always a good item to have on hand. In this review, we will discuss the three best lightweight saucepans for weak wrists to help you find the best option for you. You may also be interested in our article, ‘Lightweight pans for disabled’ here. The first lightweight saucepan is the chef’s classic nonstick saucepan by Cuisinart. This saucepan can hold up to 1 quart of sauce and weighs one pound. 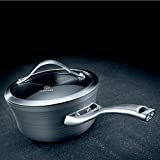 The saucepan gets its nonstick abilities from its hard anodized surface which is reinforced with titanium. Nonstick options can be quite rewarding when dealing with weak wrists. The last thing you want to do with a sore or weak wrist is to have to scrape and scrub the mess off of your saucepan. Nonstick is also a great option for those who are looking to reduce the amount of oil they use when cooking. Hard anodized cookware not only releases food better than stainless steel, but it is harder than stainless steel while still remaining quite light. The titanium reinforcements also keep it lighter than the other materials that are usually used. Additionally, the hard anodized construction makes this saucepan one of the best options for even heat distribution. This prevents hot spots and also heats up fast so that you can spend less time standing over the cooktop. Hard anodized is also known and praised for its long-lasting durability. It can handle high heats, lots of drops and bangs, is nonporous, and resistant to water. Another fantastic feature of this saucepan is the handles. They are made out of stainless steel and are riveted to the pan. This ensures that you will always have a good grip on the handle and that it will never come detached from the pan itself. The riveted addition also ensures that the handles will stay cool even when exposed to heat for long periods of time. The saucepan comes with a tempered glass lid that is clear so you can keep a close eye on your food during the cooking process. It also keeps the moisture trapped in the pan which traps flavor and prevents the food from burning. The saucepan itself is quite aesthetically pleasing. The hard anodized construction is a dark grey with stainless steel features that are sure to fit in with any design you are working with. Finally, the pan comes in at an incredibly low price point which is very appealing since the pan comes from a reputable brand and is made out of top of the line materials. The next lightweight saucepan for weak wrists is a one-quart stainless steel option. It is also by Cuisinart. Stainless steel certainly isn’t the first material you think of when trying to find a lightweight option. 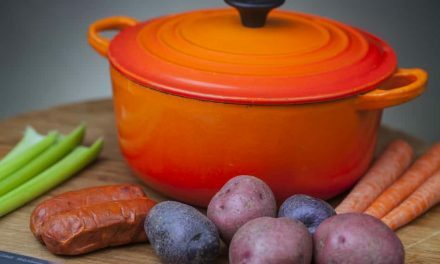 However, the combination of the durable stainless steel construction and lightweight aluminum base equals a saucepan that weighs only one pound. Stainless steel is the gold standard when it comes to professional cooking materials. It might not be the most nonstick option available, but it has many other benefits. With a stainless steel saucepan, you won’t need to worry about your food discoloring or flavors changing and reacting with the material. Additionally, stainless steel allows for various cooking techniques such as simmers, boils, and reductions. 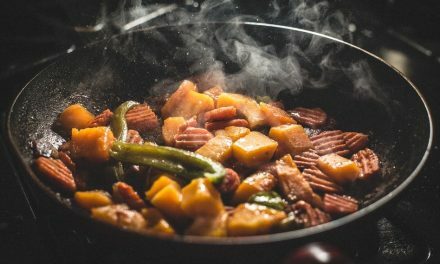 The stainless steel wraps around an aluminum base that is added to the pan to ensure that it heats up quickly and spreads the heat evenly throughout the base. Aluminum is the lightest material for this job as other options such as iron and copper can be quite heavy. The saucepan features a riveted handle that is also made from stainless steel so that it stays cool while cooking. Additionally, the rim is tapered off so that you can pour your sauce without worrying about drips and spills. The cover that is included with the pan is what Cuisinart is calling the ‘flavor lock lid.’ This lid is also made out of stainless steel and it fits tightly to the saucepan so that you never have to worry about heat or moisture escaping until you remove it. This saucepan is the perfect option for someone who is looking for a lightweight pan that is affordable, timeless, and made with professional grade construction. You really can’t go wrong with stainless steel and the fact that it is made by a reputable brand is an added bonus. Calphalon has been changing the game when it comes to hard anodized cookware, and this saucepan is no exception. When looking for a lightweight saucepan for weak wrists, aluminum should be one of the first materials you look for. It is lightweight and distributes heat better than any other cooking material. However, there is a lot of worry about cooking with aluminum which is why it should always be hard anodized. Hard anodized is a treatment that is performed on aluminum to not only make it safer to cook with, but also gives it an unmatched nonstick cooking surface. The hard anodized construction is incredibly durable, nonstick, and nonporous. This makes it a good option for someone who has weak wrists. When picking out a lightweight pan for your situation, you might only be looking at weight. However, many other aspects can benefit you in the long run. For instance, nonstick means less time cleaning or at least an easier time when cleaning. Nonporous and dishwasher safe ensures that you won’t have to waste any extra strength on the pan when it gets dirty. The durable aspect of hard anodized aluminum is just an added bonus because if the load gets too heavy, you can drop it without worrying it is going to break, chip, or crack. This particular saucepan is incredibly attractive. The hard anodized construction looks like a dark grey-brushed steel, which matches perfectly with the stainless steel handles. The handle is designed to be ergonomic, comfortable, and stay cool when cooking. The saucepan has higher sides and is more narrow than usual. This is actually quite beneficial because it reduces the amount of sauce that evaporates during slower cooking processes. The bottom is made out of a heavy gauge aluminum that pulls and distributes heat incredibly well but it is also sloped so that you can stir your sauce a lot easier. This particular saucepan is a bit larger than the other options. It is one and a half quarts and weighs one and a half pounds. The lid is a made out of tempered glass which makes it easy to monitor your food without letting moisture and heat escape. Additionally, the entire pan including the cover is oven safe up to 450 degrees. It’s dishwasher safe, and it is backed by a lifetime warranty. This saucepan comes in at a much higher price point than the first two options. However, with its incredibly beautiful design, larger vessel, and additional features, it is easy to see why. If you are looking for something that is a bit more luxurious and holds it a bit more sauce, this is the one for you. Cooking is one of the first ways we start to show our independence, as we get older. Nothing could be worse than wanting to cook and not being able to. However, these three lightweight saucepans for weak wrists are changing the game. They are allowing those who struggled before to cook with ease. 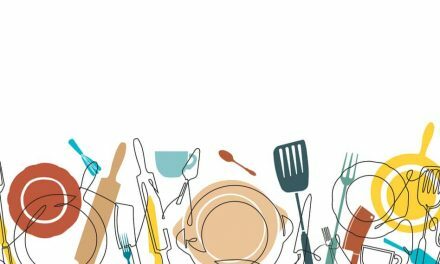 We hope this article helped you find a lightweight saucepan that can bring joy back into your kitchen. Read our review of the Top 5 Best Ceramic Cookware Sets.